Permafrost has received much attention recently because surface temperatures are rising in most permafrost areas of the earth, bringing permafrost to the edge of widespread thawing and degradation. The thawing of permafrost already occurring at the southern limits of the permafrost zone can generate dramatic changes in ecosystems and infrastructure. Evaluate the implications for infrastructure planning in Greenland and Alaska. 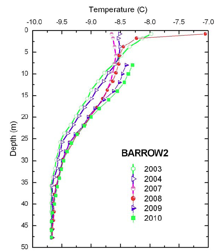 Changes in permafrost temperature at different depths at the Barrow, Alaska Permafrost Observatory, 2003–2010. For Alaska, air and ground temperature data were collected from four sites. Temperature data collected in 2006-2010 showed no significant changes except for Barrow, where mean annual soil temperatures have warmed continuously during the last several years. Mean annual temperature profiles down to 50 m depth obtained at the Barrow site show continuous warming at the depths below 10 m. This warming accelerated in 2009 and is in good agreement with accelerating warming at other coastal sites in Alaska and Russia. In Greenland, permafrost was monitored in nine sites. The data revealed changes in ground temperature regime occurring along the west coast. The transect spanned sample areas of continuous permafrost with ground temperatures around -3°C; discontinuous permafrost where permafrost boreholes showed temperatures between -1 and 0°C; and sporadic permafrost where permafrost is unstable and actively thawing, indicated by the ground temperatures at 0°C. A high-resolution regional climate model (HIRHAM model) was used to develop the permafrost simulations. Recent advances in computer power and model capabilities allowed the simulation of high spatial resolution on the order of a few kilometers. By the end of this century the bedrock mean annual temperature at 2 m below the surface will increase by an average of 1.56°C, and the mean annual temperature at 2 m in sediment will increase by 1.99°C. The active layer in sediment will increase by 0.44 m between current and future conditions; the greatest increases in the active layer depth will occur in the south. Active layer depth distributions averaged over the periods 1990-1999, 2046-2055, and 2090-2099, calculated using 5x5 km resolution climate forcing. The project results show much stronger degradation of permafrost by the end of the century as compared to lower resolution model results. The degradation is much more pronounced in the coastal areas and decreases towards the ice sheet. Strikingly, the high-resolution model results indicate much more substantial degradation of permafrost along the west coast of Greenland, even in higher latitudes. Results for Alaska are less developed at this point, but indicate that the area of permafrost degradation in Alaska is projected to be more substantial than in Greenland. By the end of the 21st century, permafrost will be stable only in the Brooks Range and on the North Slope. By contrast, the models suggest that more than half of the present-day permafrost area in Greenland will still be stable, although active layer depths will increase. 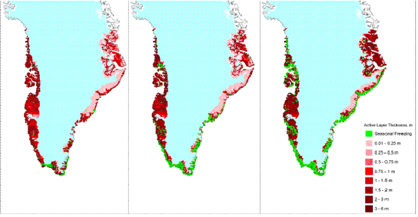 Permafrost Thaw Potential for Greenland. High thaw potential corresponds with a greater than 2.5 m potential active layer depth increase. The potential active layer depth increase was calculated by subtracting current sediment active layer depths from future bedrock active layer depths. A new risk assessment method was developed by the project to determine the risk of permafrost degradation (or Permafrost Thaw Potential, PTP) on settlement infrastructure. Risk was classified in four categories: low, limited, medium, and high, based on environmental variables and a thermal criterion. The three main variables are sediment or rock type, presence and amount of ground ice, and the ground thermal conditions. The states of these variables are determined from field investigations or estimated based on background information such as geological maps and modeling output. 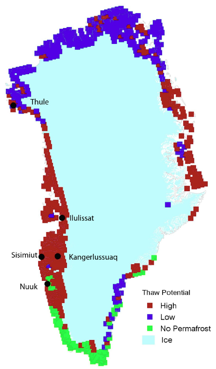 Most of the terrestrial portion of Greenland is at risk of permafrost degradation. The high-risk areas are mainly present in the southern part of the permafrost domain. In Sisimiut, the model forecasts a warming trend in the ground temperatures and present modeled permafrost temperatures as high as -1°C, so permafrost will soon be actively degrading in the area. For planning implications, this might mean that the cheapest solution to protect infrastructure is to remove perennially frozen soils and substitute them with non-frost-susceptible materials, or to use piles resting on bedrock. Due to its present resolution (25 km grid), the applied PTP approach cannot be used as design criteria for individual projects. However, high-resolution PTP mapping may be used during site-specific permafrost analysis to determine the particular permafrost degradation risk for that site. To maximize the usefulness of this approach, future research should be oriented to more specific regional and local applications. Site-specific permafrost dynamics models and risk assessment maps should be developed at a high resolution for the most vulnerable communities. For more information, contact Vladimir Romanovsky, Department of Geology and Geophysics, University of Alaska Fairbanks (veromanovsky [at] alaska.edu).